Go BIG & Don’t Give Up! A video I made to motivate myself! 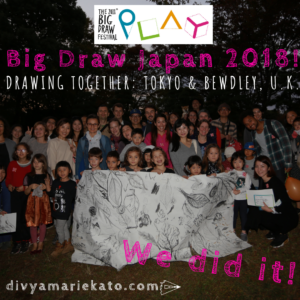 GO BIG and BUILD and HUG and PLAY and SING!! Learn how to draw through Divya’s original art empowerment programme, When In Doubt, Draw. Art in the park! 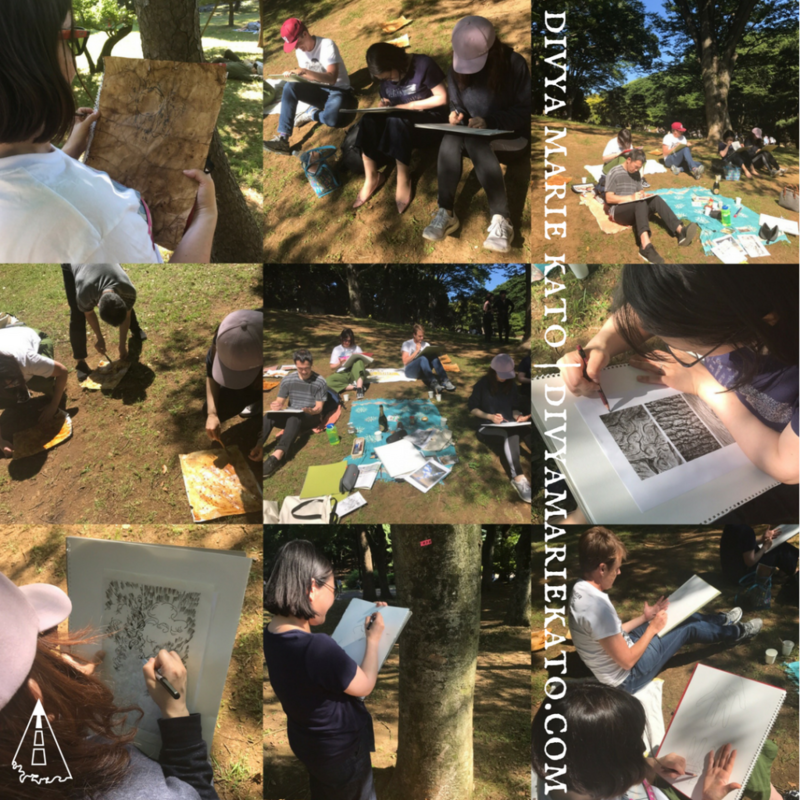 Couldn’t have picked a better day for our recent workshop in Yoyogi park. Read all about it here and find out how drawing reconnects us to nature and our place in a much bigger picture. Creativity is only increasing in value in a digital age, learn how you can nurture it here. 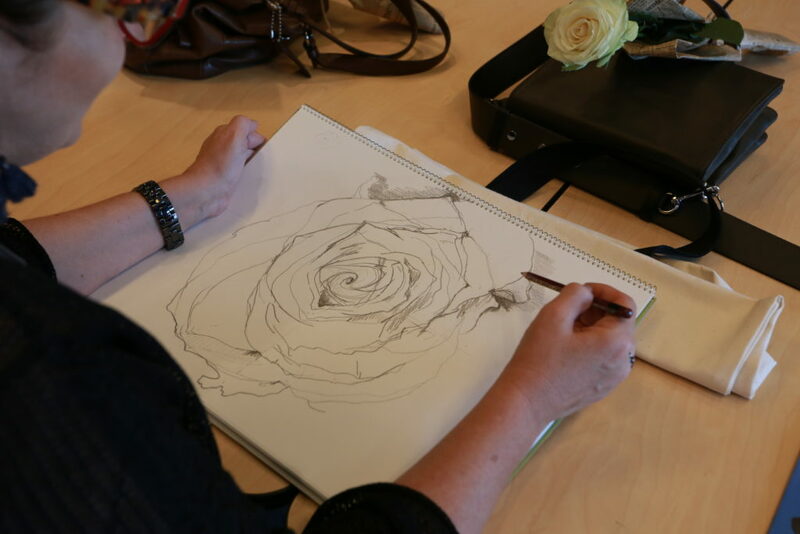 Art In The Park Workshop: Drawing In A Digital Age! 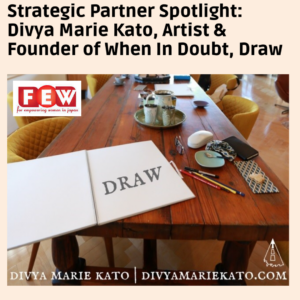 I’m happy and honoured to have you join our creative community at When In Doubt, Draw. I want you to be happy too! Ever wondered how artists work out?? 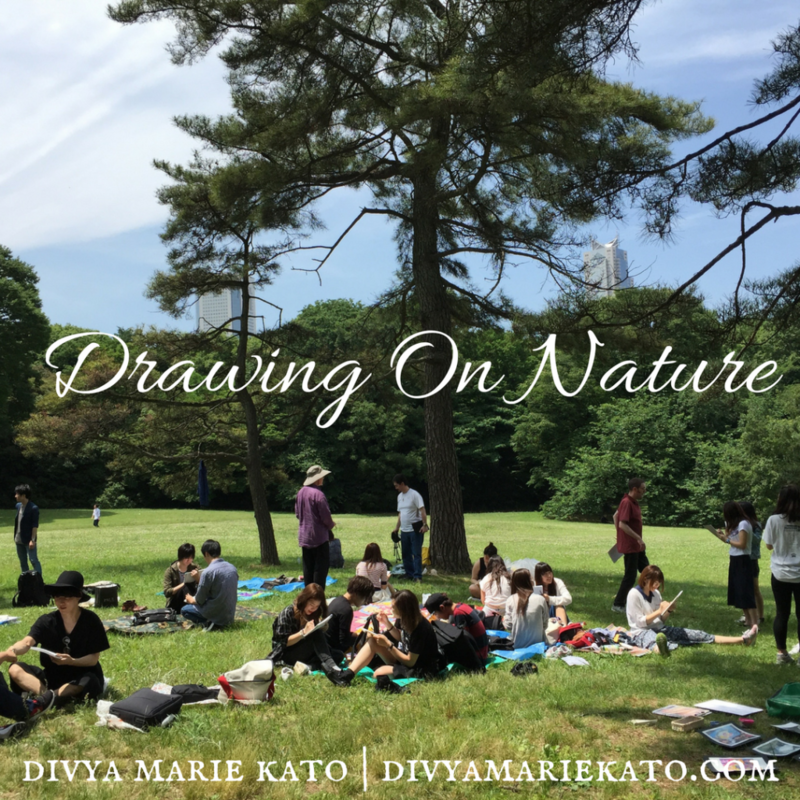 Back in Japan and am on fire – physically, spiritually and creatively. I used to make more frequent trips to India and this one was well overdue. How much India is changing and how much there is to be proud of! 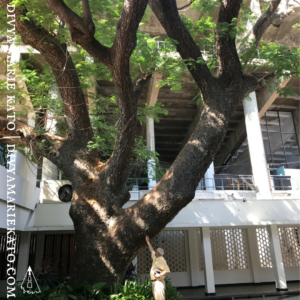 Here, I wish to share with you a very personal connection to an incredibly colourful and creative country. The most beautiful, handmade, traditional arts and crafts, paintings – both classical and contemporary – fabrics woven out of the colours and patterns of a boundless imagination and rich history and fresh food and fruits you could eat every day of your life and never get bored with. Indians are nothing if not generous and welcoming. Being family centred, funny and flexible are common traits, which allow them to get on with almost anyone. And they love to HUG. Mama brought her saris to turn into shirts for me. A week later, the shirts were delivered to us – designed and tailored to perfection. I created a few drawings, as a thank you to our host, and the trip to the framers included a personalised consultation and colour match (for the border) involving material being taken outside to a man with pots of dye, who dyed the fabric to exactly the right hue in front of us. The warm, welcoming and intimate atmosphere of Vadehra Art Gallery – everything a gallery should be! Sadly, galleries are all too often serious and indifferent spaces, but at Vadehra Gallery you feel like you’re at home. They even brought us coffee and biscuits – imagine that happening here!! Highly recommended and will be organising a trip over to Delhi with some of my students soon – if you want in, let me know! Spirituality’s nothing out of the ordinary. It’s very much part and parcel of the everyday and is woven into thoughts, ideas, exchanges and conversations. psst! 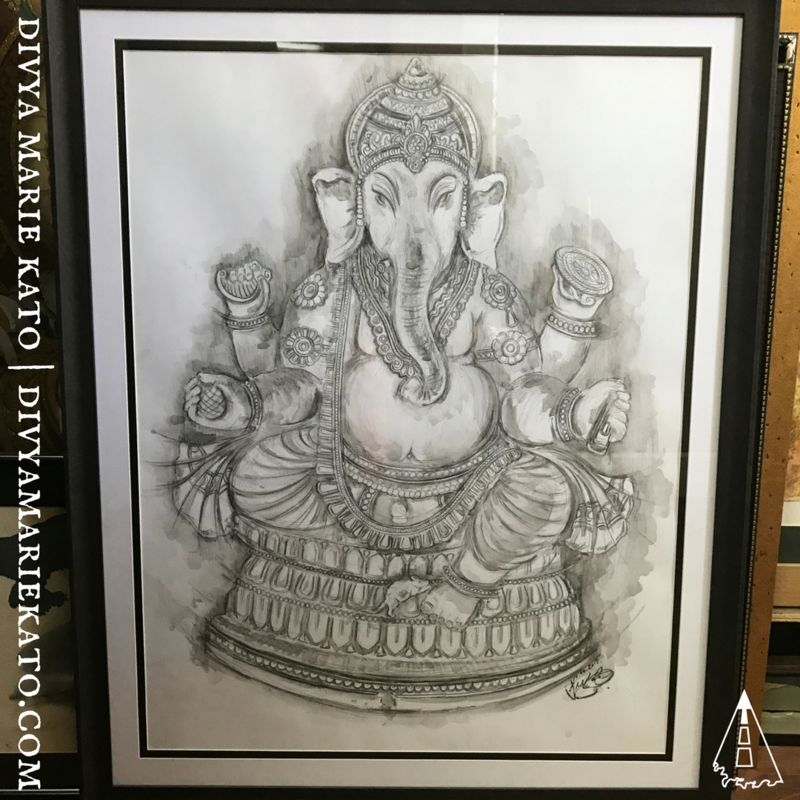 If you haven’t already, make sure you’ve got an elephant in your home facing the door – if you can, find Ganesha, remover of obstacles! Rich, rising and ready, India’s bursting with a hunger to grow, succeed and stand on its own. There’s energy, drive and a palpable hum to life. Despite having grown up in different countries, India has never been far away and I have my parents to thank for this. I have them thank for a lot of things. I was lucky to have each of them to myself on this trip and the time shared will be something I’ll remember all my life. Conversations, quiet reflection, the gentle unwrapping of memories and playful exchange of ideas about the future. 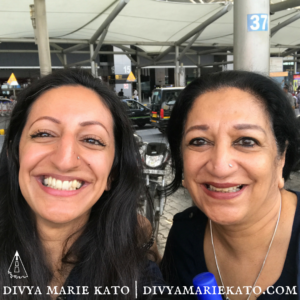 Fuelled by this reconnection with my roots and precious time spent with my parents, I’m feeling energised and deeply grateful. Here’s a postcard I made to take you with me! You’ll see snapshots of the trip, lots of (soul!) 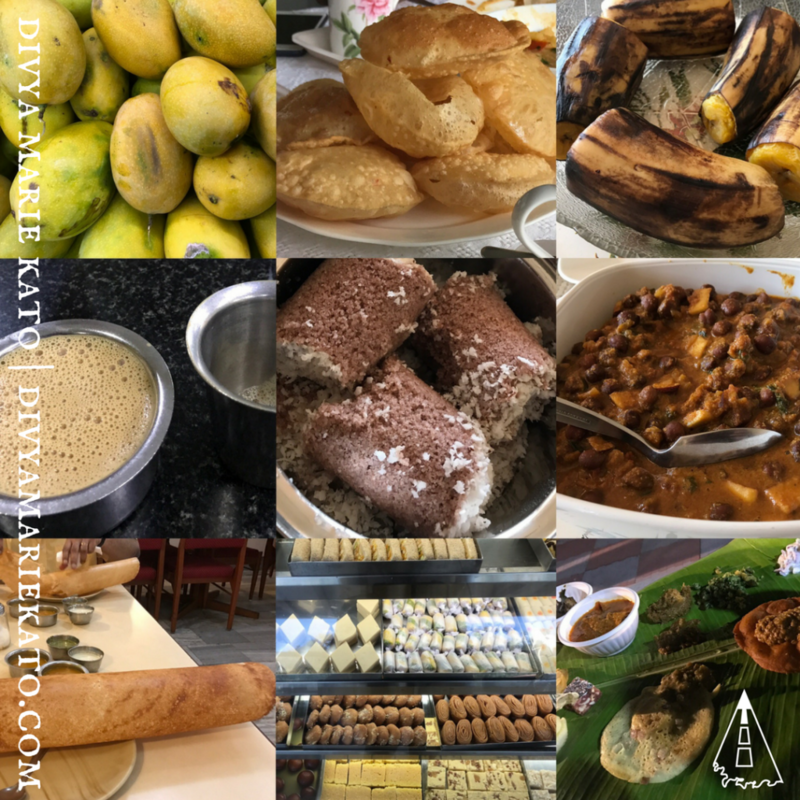 food, meet some of my family and get a rare glimpse into the studio of one of India’s leading contemporary artists, Anjolie Ela Menon. I hope you enjoy and, if you ever have the opportunity, I urge you to go and see for yourself what this incredible country has to offer. Happy Golden Week friends in Japan and happy Spring friends around the world. 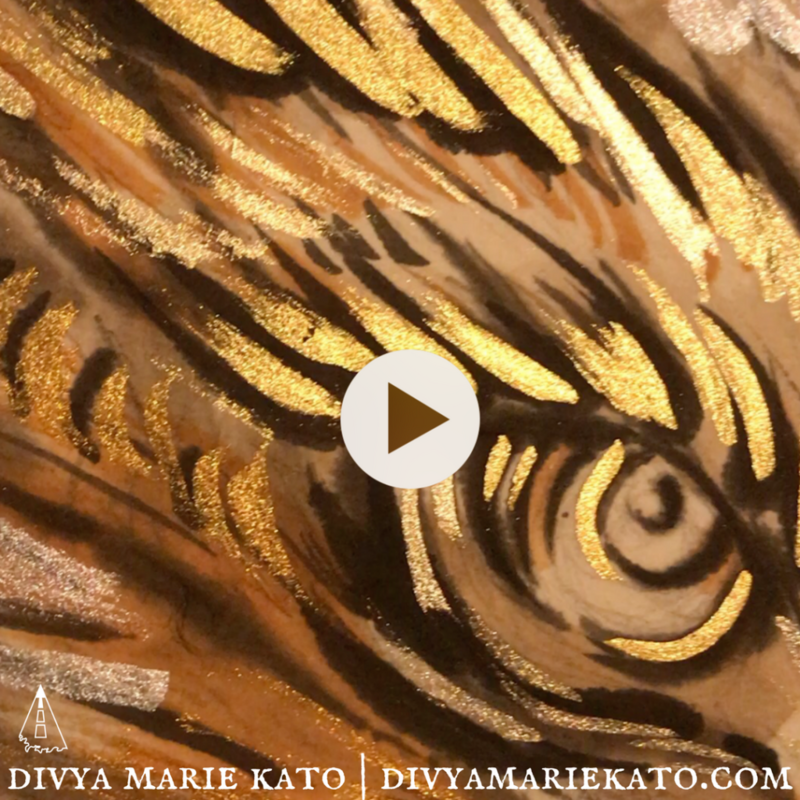 New Work On The Way… Stay Tuned! 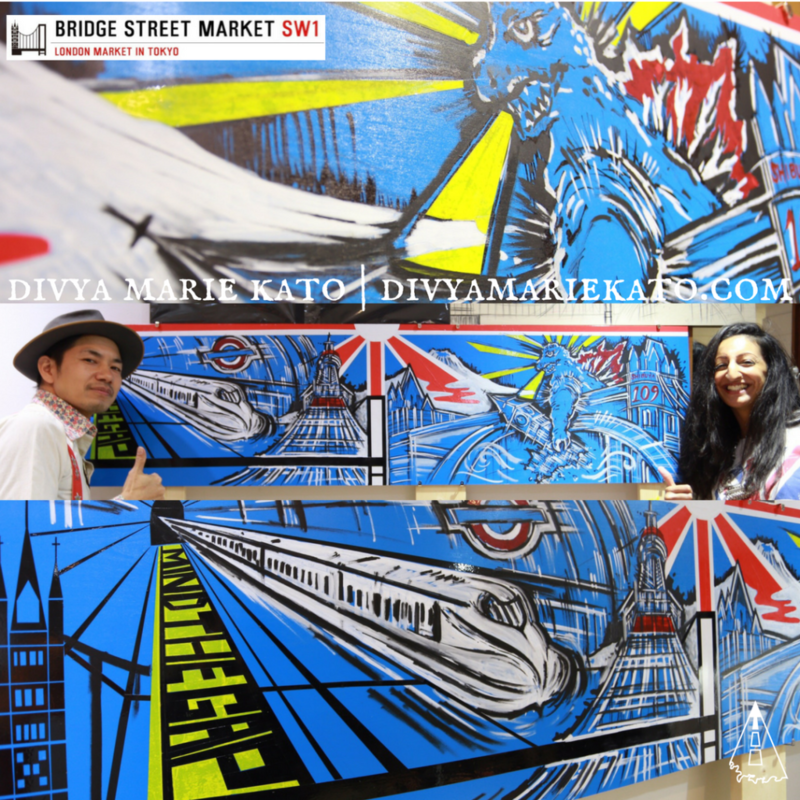 *With Divya working on a series of new paintings, she’s only accepting private students at this time. 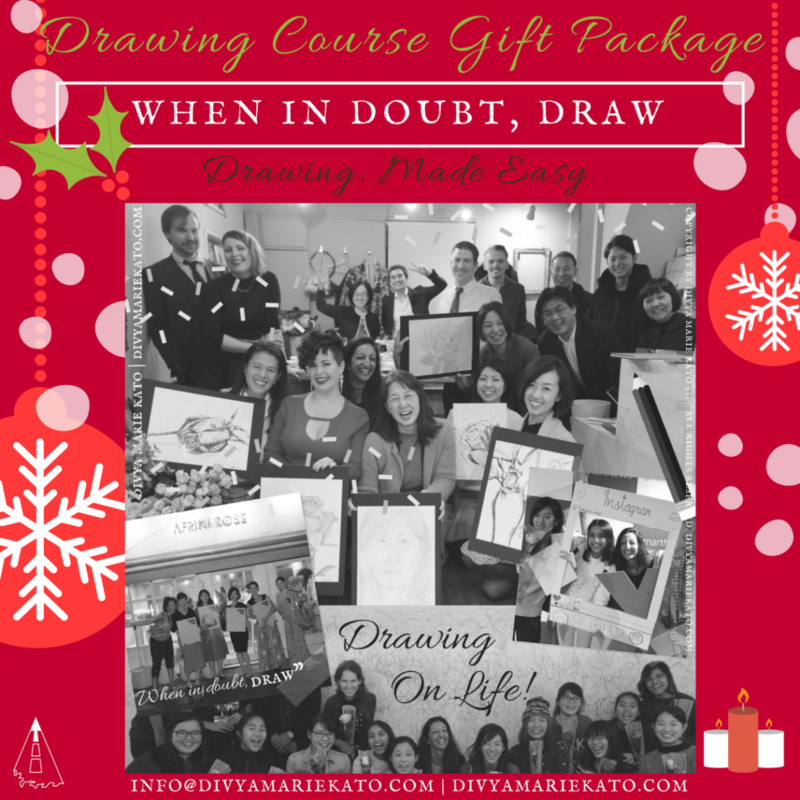 Keep an eye out for her online course (currently undergoing updates) where you can learn how to draw from the comfort of your own home. 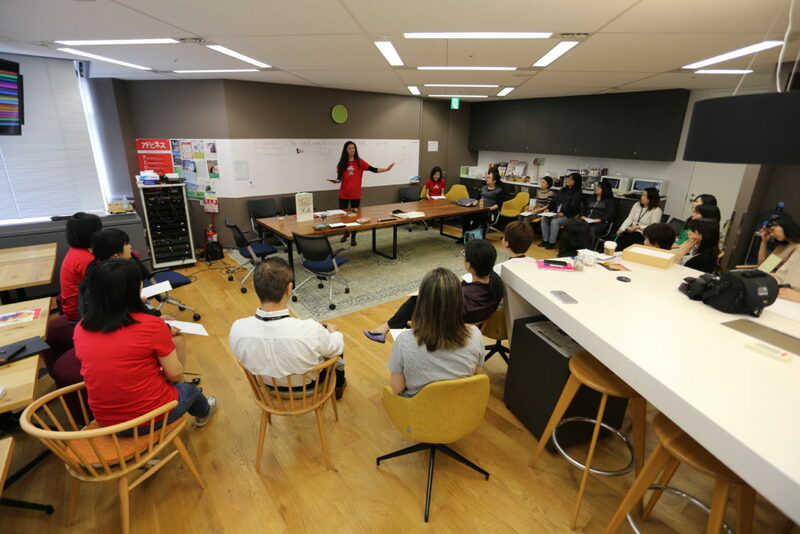 ADOBE regularly holds various events to motivate employees and ADOBE Japan are beginning to kickstart a few such events too. 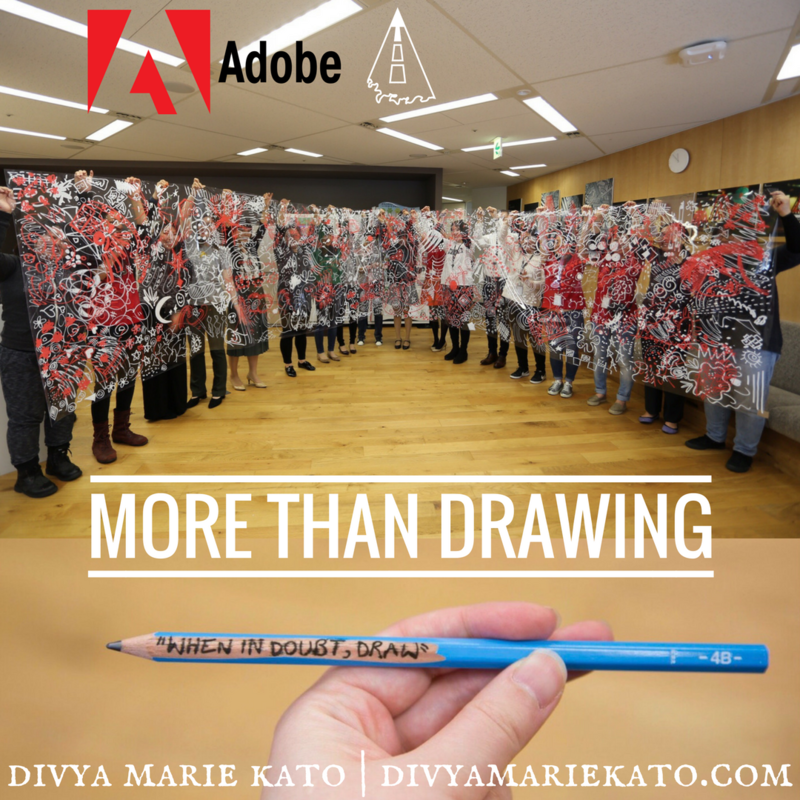 Special thanks to Yuuki Shimizu, Misa Maraun and Yoko Saito of ADOBE Japan for making this possible. Let’s help the conversation continue! 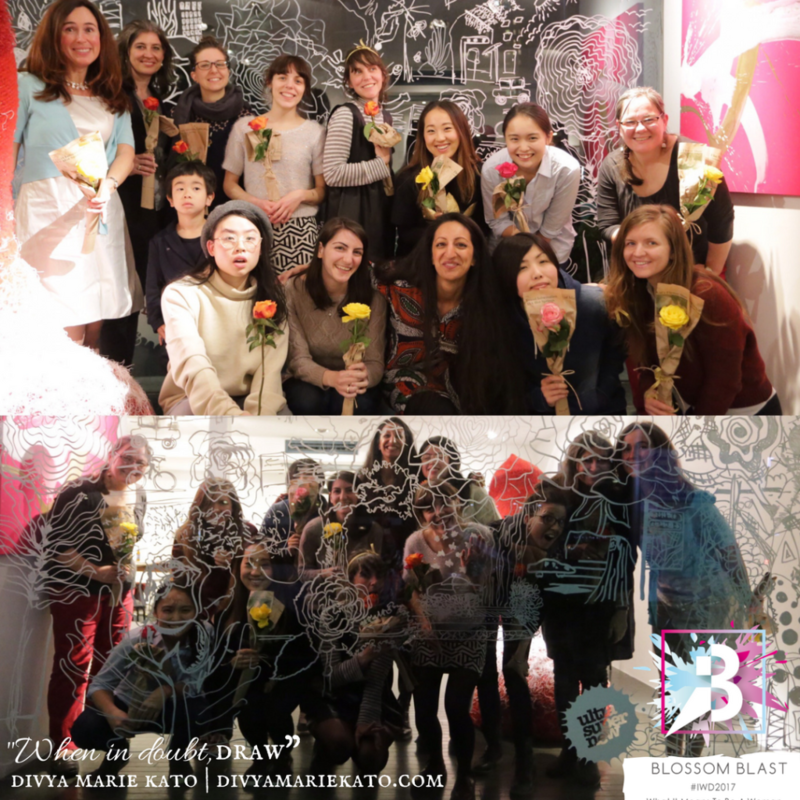 In 2017, ADOBE Japan co-sponsored Blossom Blast – an art event marking International Women’s Day. 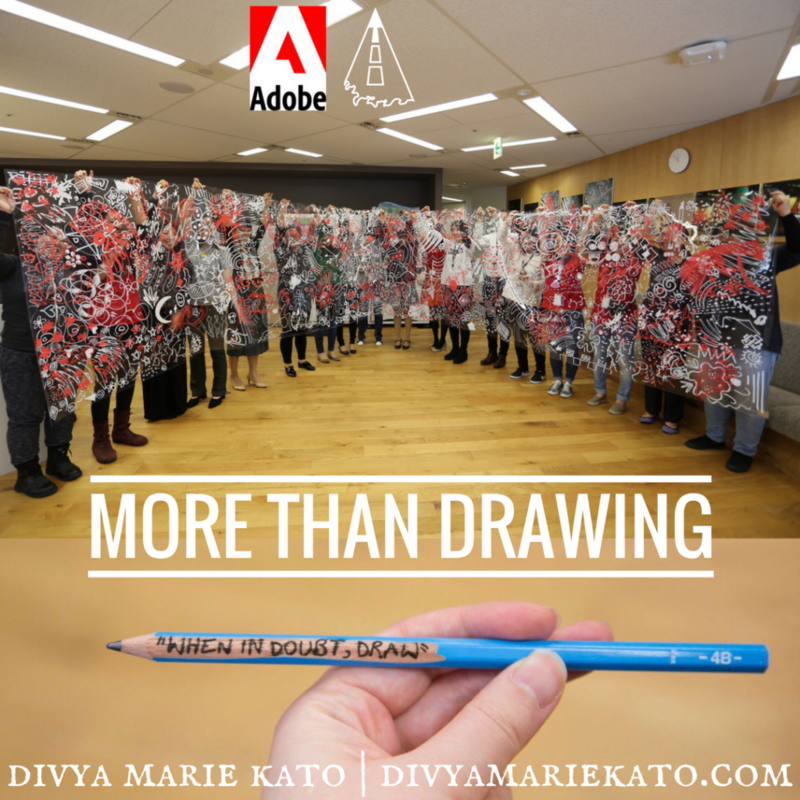 ADOBE wanted to show their support for art projects and female artists and it was during this event that they learned of the creative empowerment workshop that I facilitated there. 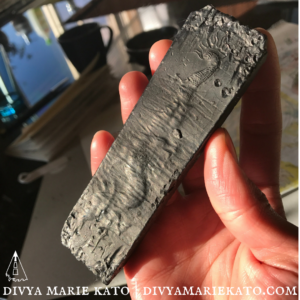 Read on for my write up and to find out more about this 3 part process. 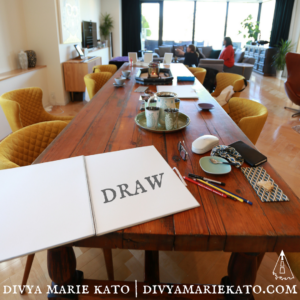 When In Doubt, Draw: What if, instead of holding us back, our doubts are the very thing we need to know where we need to go next? 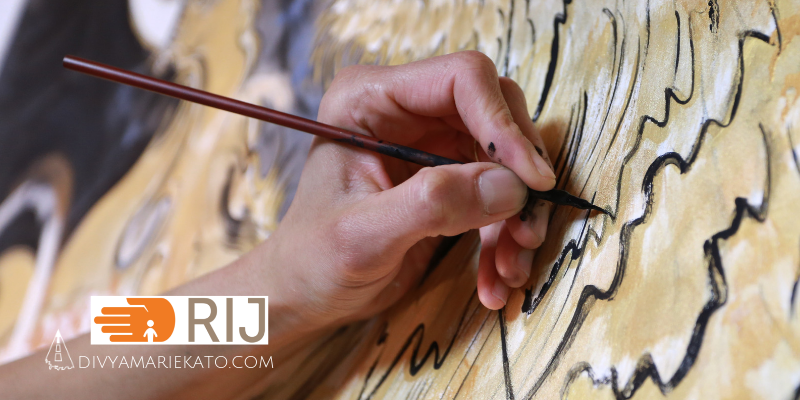 A common misconception is that creativity is a quality reserved only for artists. This is a belief I try my best to shatter! Creativity can be applied to many fields – you can get creative making bread, playing outside or in drafting a business plan. Creativity can be found everywhere and in everyone. In short, it’s a resource available to us all, but one that sadly often gets left behind at school. I’ve always found this a great shame. Why isn’t this encouraged more as we get older? However, this is what gives me the most motivation in my work – how can I re-spark this in others? How can I encourage people back to a state of play and discovery? In the process of re-sparking, I first encourage people to forget about fixed concepts of creativity, art, artist, good and bad and lay the ground work in creating a safe space for discussion and the free flow of ideas. Demands on our attention are increasing rapidly and opportunities for self reflection are decreasing. 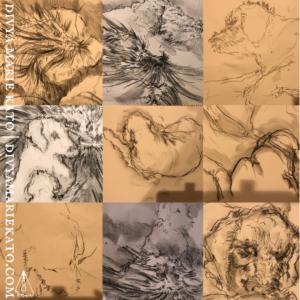 In the process of reflecting, I invite participants to come back to themselves through a simple drawing exercise that immediately invites them into a conversation with self and their place in a much bigger picture. 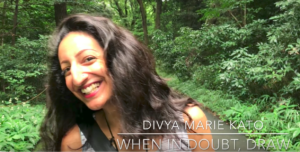 My mama has often taught me that a disconnection with self, and with our place in the world around us, is what leads to much unhappiness – that there’s a direct correlation between disconnection and unhappiness. Unfortunately, it’s now becoming rare to find time to spend alone and so we have to make the effort to find small spaces of stillness in our days. 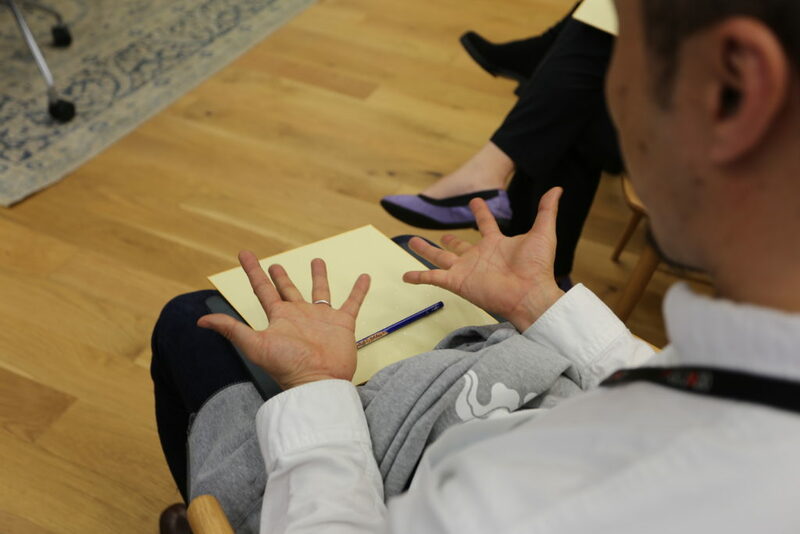 In the process of reconnecting, we came back together as a group and enjoyed a discussion about the art work that inspires us. 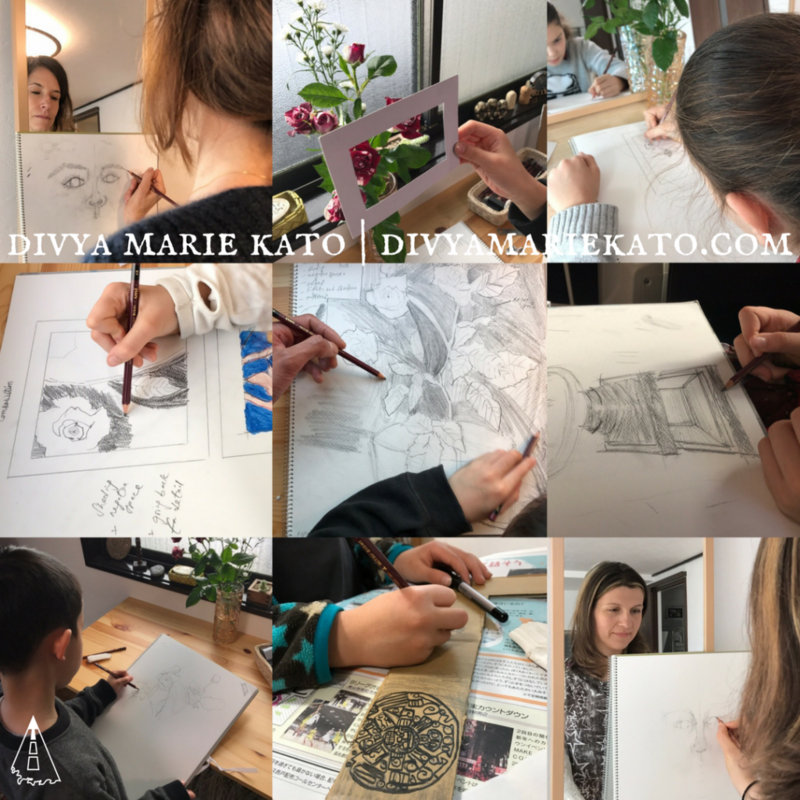 Whether a painting, photo, movie poster or album cover, this conversation sparked connection within the group as people learned what their co-workers were drawn to and why. Although formally this could be called a critique, I often feel this word puts many people off sharing their ideas. Especially when it comes to commenting on art. People wonder if they know enough or are scared of saying the wrong thing. It’s vulnerable sharing your opinion and saying how something makes you feel. Sometimes we don’t even know why we like something! But this vulnerability is the very thing that sparks innovation and connection. “85% of the men and women we’ve interviewed, 13,000 pieces of data, 85% can recall a time in school that was so shaming, it forever changed how they thought of themselves as learners. 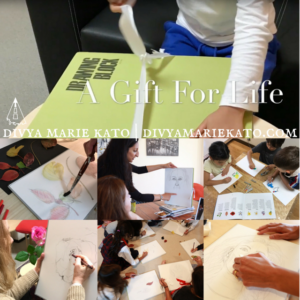 50% of those stories involved art and creativity. Now today I get asked to go into corporations, organisations and the number one problem is – there’s no innovation, we don’t understand what’s going on. Without vulnerability, there can be no creativity, there can be no innovation. 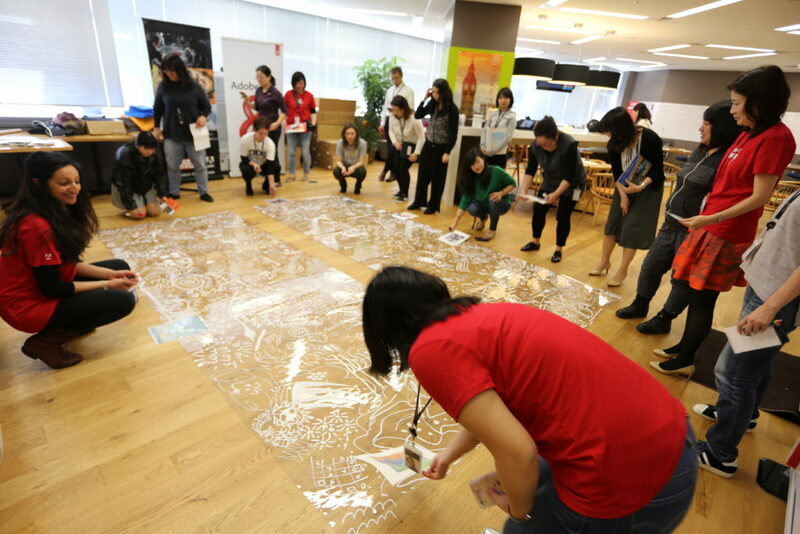 In the final part of the workshop, we get together to create a collaborative group mural and, in doing so, not only learn how to work together and merge ideas, but also about the importance of create and destroy in the process of creation. 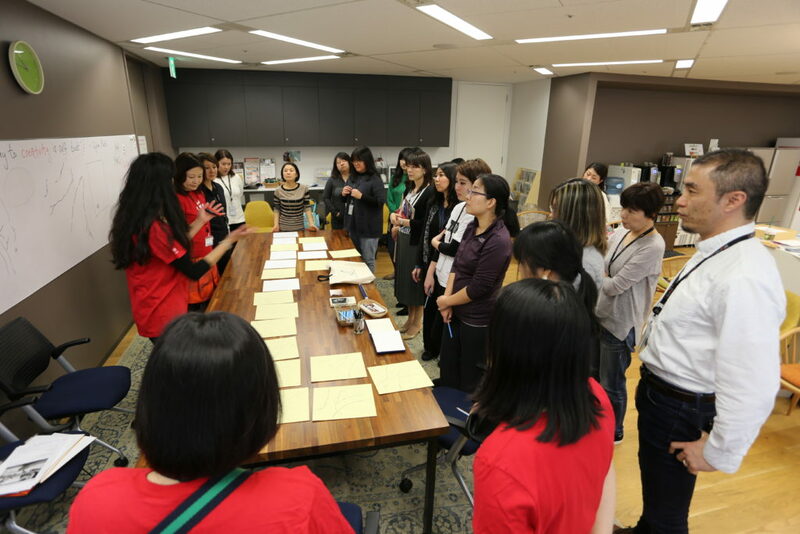 An inspiring day with the team from ADOBE Japan and what a way to kick off spring! 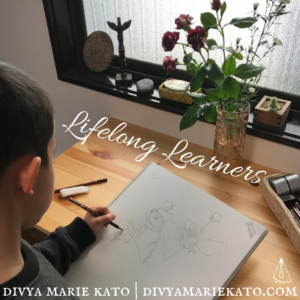 As the famous blossoms here in Japan begin to give way for fresh growth, I hope this workshop will have sparked a conversation that will continue to grow. 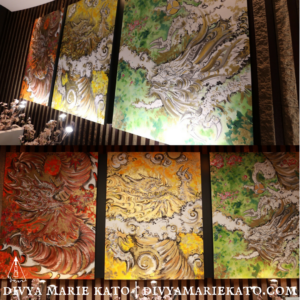 Now open to the public, Karin Restaurant, ANA Intercontinental Tokyo. March 8th brings with it International Women’s Day. A global day celebrating the social, economic, cultural and political achievements of women. The day also marks a call to action for accelerating gender parity. International Women’s Day (IWD) has occurred for well over a century, with the first​ ​March 8​ ​IWD gathering supported by over a million people in Austria, Denmark, Germany and Switzerland. Prior to this the​ Socialist Party of America, United Kingdom’s Suffragists and Suffragettes, and further groups campaigned for women equality. Today, IWD belongs to all groups collectively everywhere. 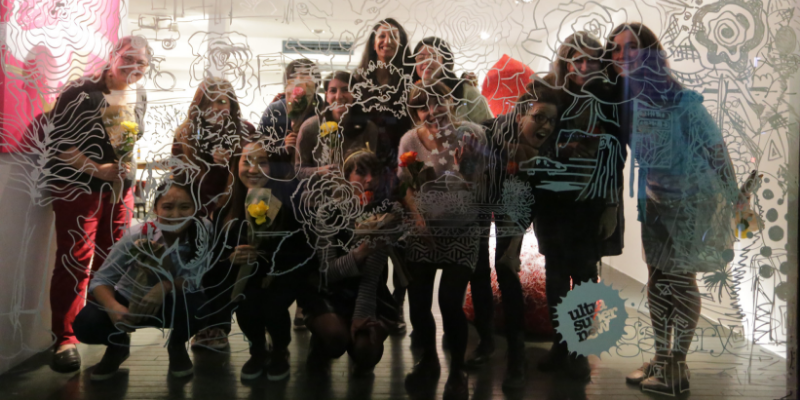 IWD is not country, group or organisation specific.​ Make IWD your day! – everyday! Almost a month into 2018 and waking up to snow falling in Tokyo with much to be grateful for. To all of our friends and students, thank you for all of your encouragement and support over the past six years. 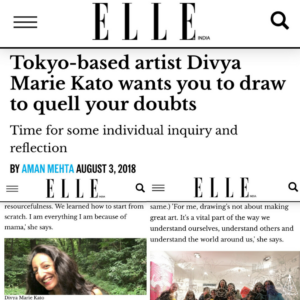 We’re thrilled to announce the opening of Atelier KATO, our first atelier in Tokyo, this January 2018 and look forward to welcoming you to the new home and HQ of When In Doubt, Draw. Location: Atelier KATO is centrally located in Yoyogi. My latest commission for ANA Intercontinental Tokyo opens February 2018 to coincide with Chinese New Year celebrations taking place in their renowned Chinese restaurant, Karin. 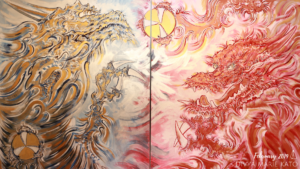 The triptych will feature dragons inspired by 2018’s animal – the dog – with a twist that runs into the heart of Karin’s philosophy. 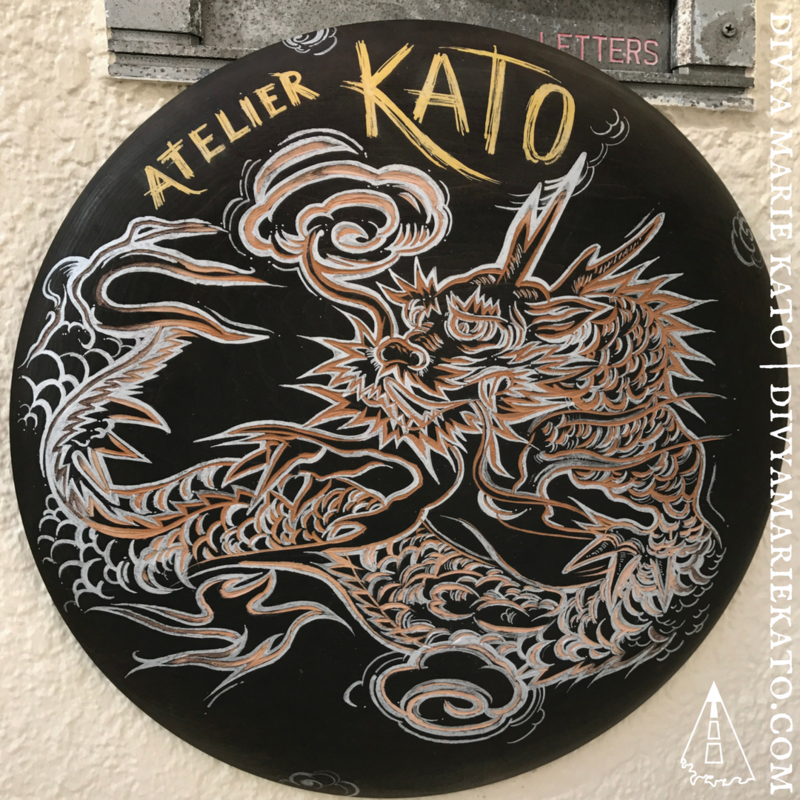 A commission that’s brought me full circle to my early days in Japan, when all I did was dragons! Wee snippet from my diary below. 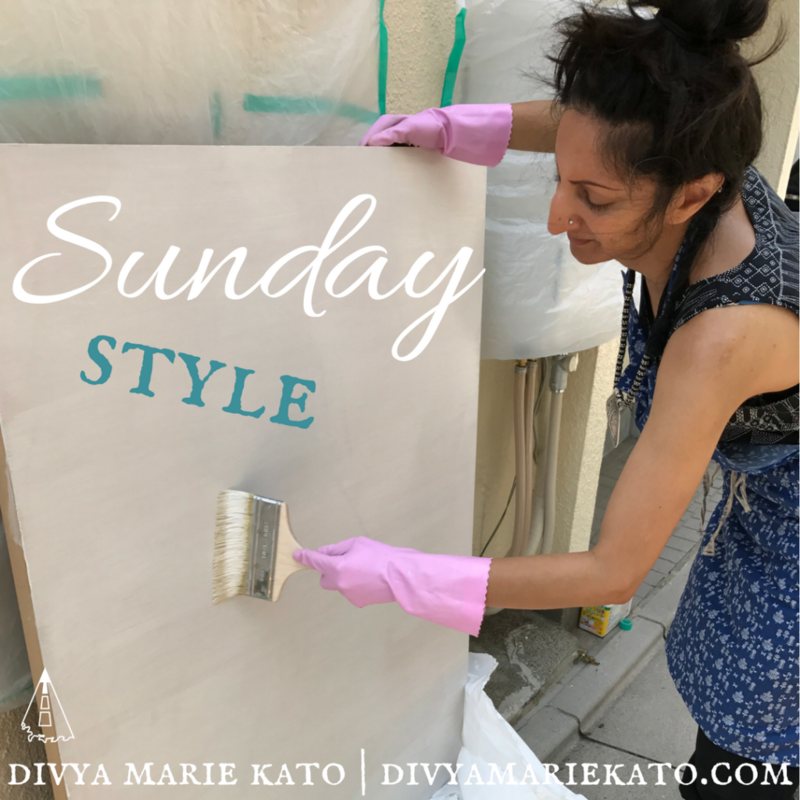 Curious about what goes into creating a piece? here’s a video we made to take you behind the scenes. Our theme for 2018? Eat, sleep, play, repeat. It really is so simple, incredibly hard to do in a fast paced, attention grabbing world, but the most important thing I learned from my new, four-legged friends, Doris and Lucy. 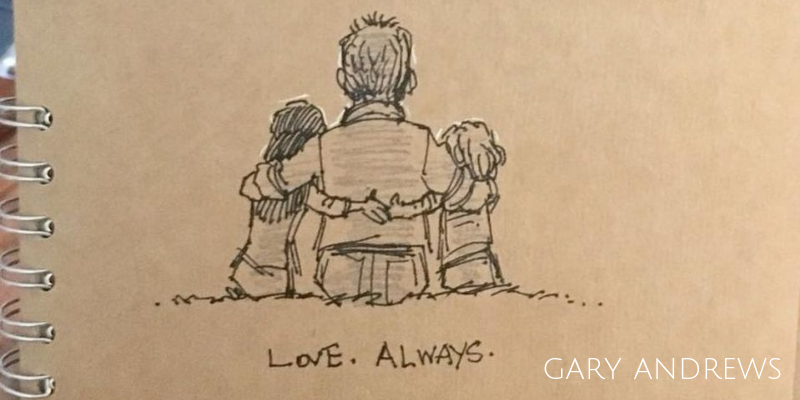 Life, working as well as personal, is made all the better by paying close attention to these three, simple things. Thank you Doris and Lucy, for the lessons, the cuddles, helping me out with lots and lots of modelling and for reminding us that all we have is now, now, NOW! 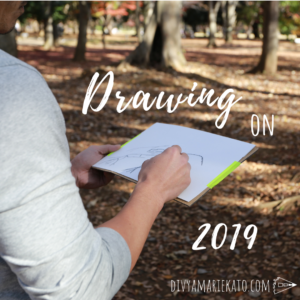 Ideas For Challenges In The New Year? Atelier Warming: First Students Of 2018! 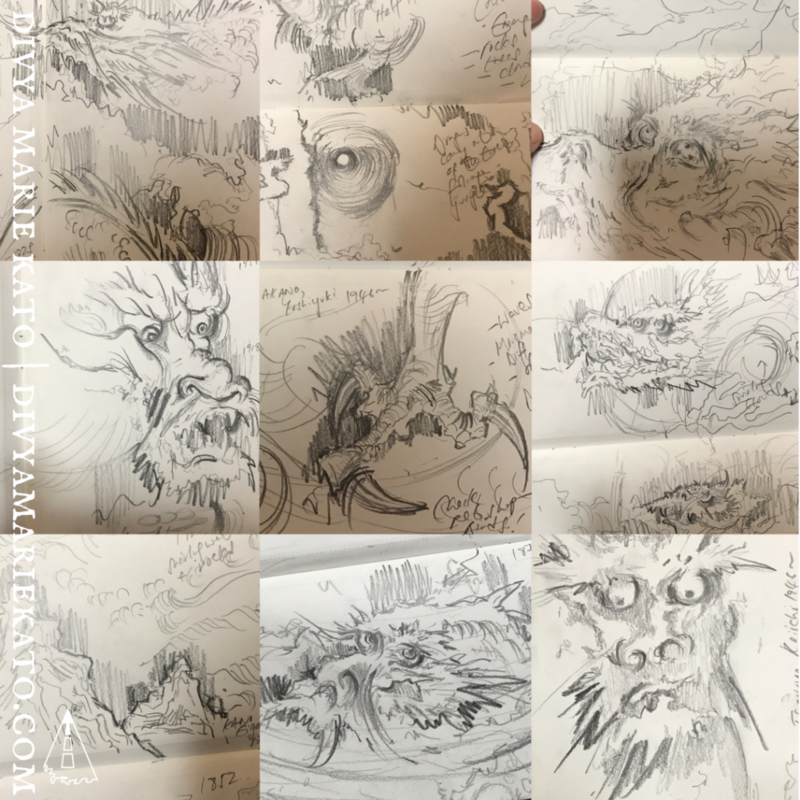 A special shout out and thank you to Mori-san – my accountant angel and a big part of our team! – for featuring me in your recent newsletter. Mori-san is a lifelong learner and is always taking up new challenges – marathons and all! 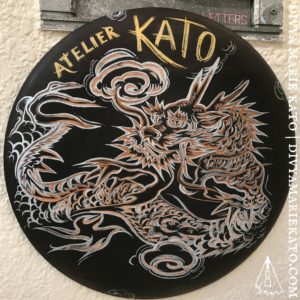 Atelier KATO looks forward to welcoming you Mori-san! Draw when you were younger, but left it behind? 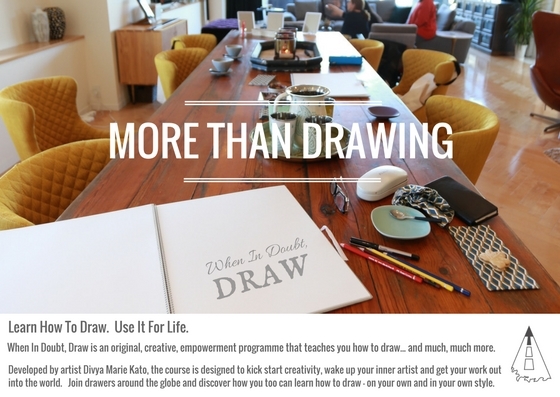 Always wanted to draw, but feel you’re not good enough? 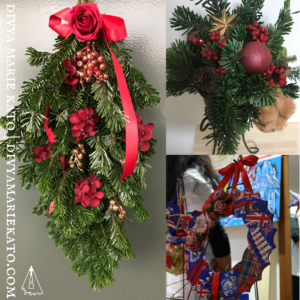 Classes open to all ages and abilities. Or have a listen to my interview on the Guy Perryman Show here – friends in Tokyo, Guy’s show is the way to wake up! Our taxi pulls up. We turn to each other and smile. The door opens and excited words rush to mingle with each other as we get in. It’s the very same driver who rescued us from the rain when we arrived. The air is warmed by the gentle unwrapping of memories and the light of the orange, afternoon sun. Our golden thank you hangs in the air long after the door closes and the taxi pulls away. The train doors close and, as our eyes lose the stretch of platform, we follow our thoughts as they play hide and seek between trees and run across fields and sky. Recollections rolled into sunset’s soft blanket. We make our way back to the city. Our hands find each other and we melt into sleep. Sleep marinated in the richness of adventure. This two day trip, filled with more gifts than we could fit into our backpacks, spills into our dreams. For this weekend, we ran with dragons.